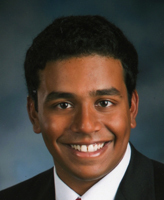 As a senior in high school, Allan Joseph did not want to go to Notre Dame. That changed in spring 2009 when Joseph attended Reilly Weekend, an on-campus event for high-achieving students, and was invited to join the John and Barbara Glynn Family Honors Program if he chose to enroll at the University. “The honors program wasn’t a huge factor in my mind at first,” Allan says. “Then I went to Reilly Weekend, got to meet the people in the program, saw the opportunities—and just fell in love with the whole thing. Among Joseph’s favorite aspects of the program are the small honors seminars in which Glynn scholars can fulfill most of their University requirements during their first two years at Notre Dame. For Joseph, the close relationships students develop with faculty—from Dr. Hugh R. Page, Ph.D., dean of the First Year of Studies to Professor Neil Delaney, professor of philosophy and director of the Honors Program—is another key aspect of the program. The Glynn program also offers students a number of off-campus trips and summer research funding. Joseph, for example, spent the past three summers conducting research, funded by the honors program, at Nationwide Children’s Hospital in Columbus, Ohio. Before graduation, all Glynn scholars also complete a senior thesis, working one-on-one with a mentor to pursue an independent research or creative project in their chosen field of study. Under the direction of William Evans, the Keough-Hesburgh professor of economics, Joseph is studying a program designed to help primary care physicians treat their child asthma patients. During his time at Notre Dame, Joseph has distinguished himself both inside and outside the Glynn program. As the 2012-13 editor-in-chief of The Observer, Notre Dame’s independent student-run newspaper, Joseph led a revamp of the paper’s print design and online presence, even while tackling the day-to-day challenges of daily publication. He also twice attended and once ran the spring Washington, D.C., Health Care Seminar through the Center for Social Concerns. And he has been active in Class Council and Hall Government. While Joseph’s accomplishments are outstanding, they are the kind that Glynn scholars achieve with uncommon frequency. “It’s an exciting place for people who are curious about the world and want to engage in the tough questions,” Joseph says. Originally published by Chris Milazzo at al.nd.edu on April 17, 2013.